Emil Oweis, MD, is a board-certified pulmonary and critical care attending physician and is an Associate Medical Director of Respiratory Therapy at MedStar Washington Hospital Center. He is also Associate Director of the Adult Cystic Fibrosis Clinic at the Children’s National Medical Center. He is a member of the American College of Chest Physicians, the American Medical Association, and the American College of Physicians. As a pulmonary & critical care specialist, Dr. Oweis is dedicated to the diagnosis and treatment of common and uncommon respiratory diseases including, but not limited to, chronic obstructive pulmonary disease (COPD), cystic fibrosis, emphysema, asthma, sleep apnea, pulmonary embolism, respiratory infection, and other conditions that may cause difficulty breathing. In addition, he manages critically ill patients in the medical intensive care unit (ICU) who require aggressive medical therapy and life support. His diagnostic and treatment methods include catheter-based therapies, medications, mechanical ventilator management, and interpretation of pulmonary function tests in addition to open, less invasive, and non-surgical procedures, which include video-assisted flexible bronchoscopy, central line placement, pleural fluid sampling, and endotracheal intubation. Dr. Oweis’ clinical interests include adult cystic fibrosis, COPD, and mechanical ventilator management. His research efforts focus on the improvement of clinical education among physicians and other healthcare workers. He is also involved in quality and process improvement of health care, particularly concerning ICU and respiratory therapy practices. Dr. Oweis is also passionate about the huge advancements in the treatment of both cystic fibrosis and lung cancer. Dr. Oweis received his medical degree from the University of Jordan and completed an internship at Jordan Hospital in Amman. 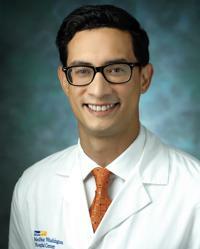 He then joined MedStar Georgetown University Hospital/Washington Hospital Center for a four-year residency in internal medicine, the last year of which he served as Chief Medical Resident. He continued his training with MedStar Georgetown University Hospital/Washington Hospital Center for a three-year specialty fellowship in pulmonary and critical care medicine, where he also served as Chief Clinical Fellow. Dr. Oweis is fluent in Arabic and is conversational in French. When not caring for patients in the ICU, Dr. Oweis enjoys playing basketball, traveling, and exploring new culinary experiences. “My vision is to deliver state-of-the-art, patient-centered, and evidence-based treatment to people with lung disease.